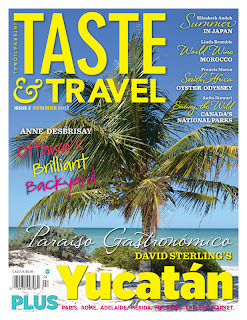 The Summer issue of Taste & Travel is on store shelves now. Travel to several countries and savour the unusual and delicious recipes between the pages of this gorgeous magazine. This issue covers the Yucatán, Paris, Rome, Adelaide, Merida, Malaysia, and New York. You'll see a preview of David Sterling's forthcoming book on the cuisine of Mexico's Yucatán Peninsula, a feature about the glorious food in Ottawa's backyard, details about the legendary Knysna oyster from South Africa and get a visual taste of the Chelsea Market in New York City. You'll find recipes for eel, elk, goat, curried spaghetti and bread pudding to name just a few. 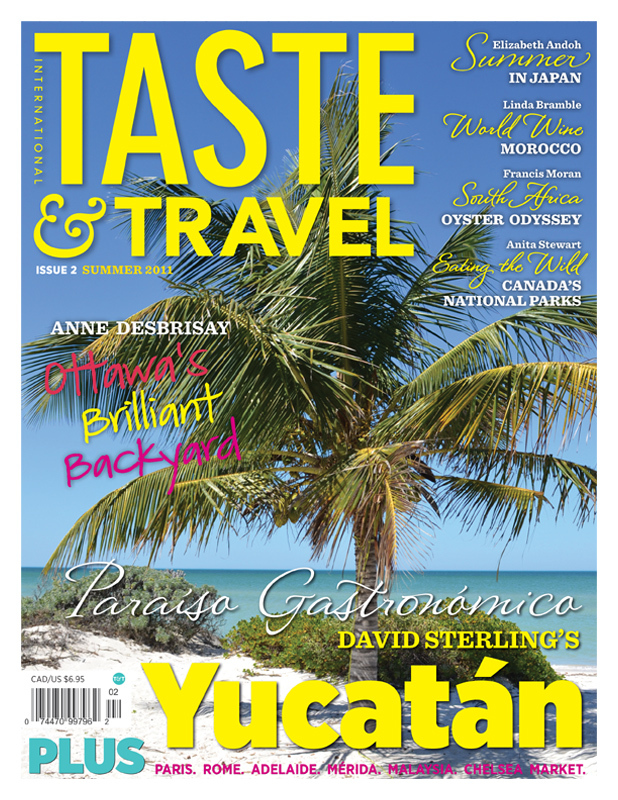 The head office of Taste & Travel is in the village of Metcalfe, Ontario, but relies on an editorial team that is international. The creative director is in New Zealand, the senior editorial consultant lives most of the year in Southeast Asia, a contributing editor works out of Japan and a team of other staff members reside in exotic locales. I had fun doing some recipe testing and photography for this issue and am excited to work with the magazine. Since it sells out quickly, you may want to subscribe so that you won't miss an issue.